Not only did the unemployment rate hold at 9.5 percent, but last week the number of initial unemployment claims climbed to 479,000 -- that's 19,000 more than the week before. 131,000 jobs were lost in July, and private employers added only 71,000 jobs in July--that's 12,000 less than they added in June, and fewer than the 90,000 experts predicted. These numbers leave us scratching our heads and wondering whatever happened to the recovery? Were reports that the recession is over just a ploy to boost our morale? Could this be a case of one step forward, two steps back, or is it a sign of the dreaded double-dip recession? And what is a double-dip recession, anyway? Well, basically, it's a recession, followed by a short recovery, followed by another recession. The second recession can be even worse, because it hits us when we're down and robs us of the little hope we were just beginning to regain. Realistically, could that be the scenario here? "I don't think so," says jobs expert Harry Griendling, CEO of DoubleStar, Inc. "In a recovery, historically jobs come back last and they come back slow." He's referring to the trend for productivity and the financial markets to bounce back first and faster. 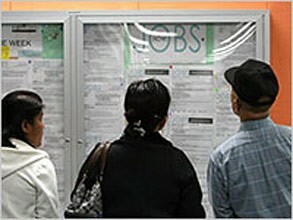 "Given the depth of the current recession, jobs will come back even slower." "Job loss usually hits a peak, then hovers on a plateau for awhile," he explains, which is exactly what is happening now. For the past quarter, the unemployment rate has hovered around 9.5 precent, give or take a few tenths of a percent. Griendling suggests that job seekers pay more attention to quarterly numbers than monthly numbers, which are not as indicative of the direction of the economy. However, he also believes that some jobs, especially in construction and manufacturing, are gone for good and will never come back. He says that people in those industries should definitely retrain, and notes that there's more hiring going on in pharmaceuticals, health care, information technology and financial services. In essence, Griendling believes that unemployment numbers will "stay flat through the end of the year, then work their way down in 2011." David Mann, regional head of Research, Americas at Standard Chartered Bank, thinks it's going to be an even longer, slower road to recovery, and doubts the economy will ever return to the way it was in, say, 2006. "And that's not necessarily a bad thing," he says, noting that four years ago, people were using their homes like ATMs, and were spending far more than they could afford, accumulating massive debt. "It's preferable to have a longer-term, more sustainable rate of growth," he says. While that may be good in the long run, it doesn't help the unemployed much in the short term. "The employment situation is the weakest it's been in post war history," Mann notes. "We predict a long period of sluggish growth, but no new recession." He thinks it will take the economy two to three years to get back on track, and encourages workers to use the time they're unemployed -- which is averaging longer than ever -- to "boost and improve your skill sets. Don't become rusty. Keep yourself as relevant and attractive to employers as possible." Griendling is able to offer a few glimmers of hope for the unemployed. "On a positive note, we see that people are getting ready to hire," he says, explaining that his company has found a hiring uptick in the employment services and recruitment industries. "Companies added to their recruitment staffs in the second quarter," which means they're getting ready to fill positions with new employees. And there is relief for some. Last month Congress restored aid to about 2.5 million unemployed Americans whose benefits had lapsed in May. Also, extended benefits are currently available in Alabama, Alaska, Arizona, California, Colorado, Connecticut, Delaware, the District of Columbia, Florida, Georgia, Idaho, Illinois, Indiana, Kansas, Kentucky, Maine, Massachusetts, Michigan, Minnesota, Missouri, Nevada, New Hampshire, New Jersey, New Mexico, New York, North Carolina, Ohio, Oregon, Pennsylvania, Puerto Rico, Rhode Island, South Carolina, Tennessee, Texas, Virginia, Washington, West Virginia, and Wisconsin. Both Griending and Mann agree that it is absolutely essential for the unemployed to retrain and stay sharp, before their options run out. And that could take some time.